Disclaimer: This post contains affiliate links which means if you happen to make a purchase, YBC will earn a small commission. Thanks for the support! If you've been reading for a while, you know that a big part of healing hormonal acne was incorporating more micronutrients into my diet after healing my gut through the GAPS diet. 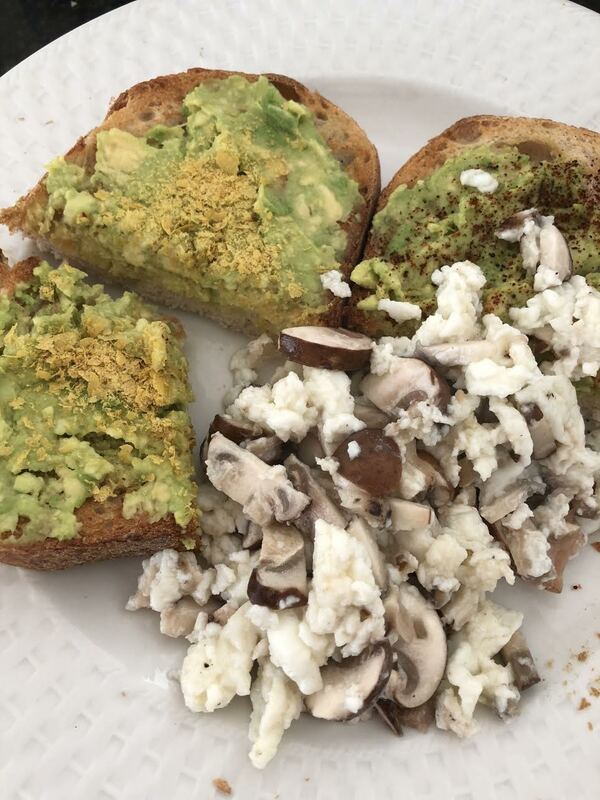 I am constantly on the quest for having a variety of foods throughout the day, so I thought I'd share five breakfasts I've had recently in case you're looking to switch things up. They say breakfast is the most important part of the day, and I feel like so many of us (especially those of us who don't have the luxury of working from home) are rushed in the morning and just grab whatever is quick and easy, and often time quick and easy doesn't equate to varied, whole and healthy. These breakfasts all take very little time so I hope they'll be helpful to you! Blend everything in a high powered blender, and top with granola. I finally found a granola that didn't have added sugar or any sweetener (I'm experimenting with lowering unnecessary sugars in my diet) - it's a local brand called Backroads. Bring 3 cups water (or if you're feeling brave, broth! It is SO good!) and 1/4 tsp salt to a boil then add 1 cup Steel Cut Oats. Reduce heat to a low simmer. Cover and cook for seven to ten minutes, depending on how chewy you like your oatmeal, stirring occasionally. Remove from heat and let stand covered for a 1 minute. Yields about 3 cups (you can store the leftovers for the next few days). Portion out what you'd like, add 1/2c milk of choice, top with cinnamon for flavor, dried fruit for sweetness, and nuts and pumpkin seeds for crunch. Ok these muffins take a little longer to make than the other recipes here but if you make them the night before, you'll have them to just quickly grab as you head out the door! You can put anything inside them - or you could even portion out your add-ins for more variety. This particular batch had spinach, onions, sausage, and potatoes. Daily Harvest has a ton of delicious, quick and easy breakfast choices. This particular one was called Activated Breakfast, and they were overnight oats with banana, chia, almond butter, pea protein, hemp hearts and cacao. You just put 1/2c of milk of choice (or more, if you want it creamier) and leave it overnight. In the morning, grab and go. You can use code YogaByCandace for 3 free smoothies here. Cut the fixin's for your scramble. This one is just onions and mushrooms. Sautee over medium heat. Add 3 egg whites to the pan and scramble (I buy organic pasture raised egg whites in a carton - check the label because sometimes they put 'liquid egg white mixture' which is not actually egg whites (who even knows what it is?! ), so just make sure it says egg whites). Hope those are helpful! I'd love to hear what your current breakfasts look like down in the comments below!